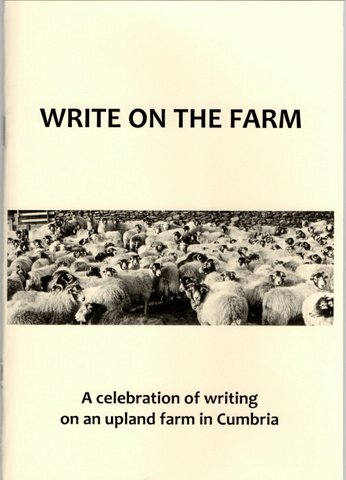 June 24th Write on the Farm, 10.30am-4.30pm – part of the day will be an outdoor session at Burns Beck Moss (near Jane’s farm). Write on the Farm workshops start up again in September – dates to be confirmed. November 2nd, Poetry Evening, Brantwood Coniston with Geraldine Green, Kerry Darbishire, Graham Mort and Kim Moore. Open Mic places limited to six – book early to reserve your slot! And a full month with poetry friends, in Oklahoma, San Diego, Long Island, New York City, New Jersey ending with the River to River Festival at Beacon, Hudson Valley, upstate New York. I’m still pinching meself – did it happen? was it real! Yep and yep! 2008/2009: So here I am now back in England, mostly raining, something to get back used to. I love the warm rain in NY, doesn’t matter if it’s thunder, lightning and pelting down in cats and dogs! It’s still warm and the extreme weather suits me. Anyhow, I’m doing this out of synch. I’ll start again. The trip came about bit by bit over the last what? 8 months? Nine months? And yep, a little like pregnancy, seeded and fruited! First, an invite to read at the Woody Guthrie Festival, so ok, yes, for sure I’d love to - then an idea to head over to the West coast, take in a couple of readings and fly across to OK for the WoodyFest… that didn’t quite pan out, tho I did make the Woodyfest and a trip to stay with poet friends in San Diego. So we arrived in OK, late cos of a delay in Atlanta … jeez! Planes queuing up on the runway, like a traffic jam on the M6! Anyhow, so Carol Hamilton, our lovely patient poet friend, collected us and shepherded to her home, where we stayed til the following Tuesday. That was some stay! After a late night, early morning, and a long lazy lie in, and after lunch with a couple of Carol’s friends, we collected George (Wallace) from the airport and whumph! Straight off to the Sac and Fox Pow Wow, just outside Strioud. It was an interesting mix of timeless rituals meets contemporary America, in that a round the sacred circle, where the menfolk musicians sat in the centre, there were hotdog stands, ice cream vendors, an ordinary, extraordinary mix of energies, kids running around, women in sumptuous clothes and shawls…. The chief dancer with his full feathered head dress on, the drummer, in an everyday, all American t-shirt… the young women who, once they’d completed a dance, removed their shawls and become once more, young 21st century women. Yet, moments earlier they’d been entranced and entranced as they took measured steps around the circle as the men played and sang, a haunting song and the drummer beat as if calling the earth to respond. We sat on and watched the women dance, and the children being led round the sacred circle by a grandfather elder who held the hand of the first child and was bending low, talking quiet to the front children, with tales of how their Nation came into being. I overheard snippets as I took photos. It was a moving moment, there, as the sun set behind the trees, on that raised ground with the Plains stretching on all sides and across the road, down the way a little, a Casino, run by the Sac and Fox People. One of the joys of the whole trip was the memory games we’d play, mostly when we’d be driving along, ‘what was the name of the creek Carol took us to where we saw that squirrel and you held your hand out, and it came up and sniffed it?’ ‘Soldier Creek?’ ‘Yes!’ and what does the name ‘Oklahoma’ mean? ‘Land of the Red Man?’ Yep! OK your turn to ask a question…. Right, what year was the Oklahoma Land Run?’ 1889? Yay! You got it!. This meant we’d be all pretty clued up wherever we went! Sitting here, staring out my little study window, on another rainy day in August, typing this takes me straight back to the fierce heat of Oklahoma … ‘ you guys sure are lucky! Last year it was 110 degrees, wasn’t it George? Remember?’ Carol would tell us how hot it had been in 2007 at The Woody Fest and how they’d been sweating and George just would not stop playing Bocci, even in the heat! What did we think of Oklahoma, the poetry, the heat! And were we looking forward to the WoodyFest. The spirit of Woody was there in the simple communal activity of around 12 poets walking round the table, chatting, sipping wine, but intent on the job in hand: pick up, collate, shuffle poems into a set, put down for the collator to do their job. We were made so very welcome wherever we went and I especially found the Oklahomans down to earth and friendly, very in touch with the land. 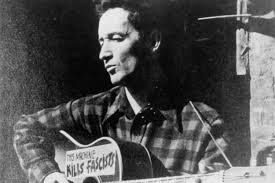 Their poetry centred a lot around the Dust Bowl years, the Depression, relating similar stories in their poems to that experienced by Woody and his family. The land, especially, the Indigenous Native American Indians, plants and animals featured strongly. I was influenced by all these tales and that night dreamed of a Bobcat, which yes, featured in the first poem I wrote on the visit. The poets we met at this informal evening were, like us, heading off to the Woody Fest the following morning where we’d be reading together in Okemah, Woody’s birthplace. Look at that! You said. as I squatted by the black oak. in covers and your body. haunches taut, ready to spring. We set off fairly early, planning to get to Okemah in time for Mary Jo’s Pancake Breakfast – I have the t-shirt to prove it! But no pancakes! It was cool, though we were too late for pancakes, Geoff reckons there weren’t any as we couldn’t see any signs of them having been eaten, looking at the tables outside, where the garden area was packed to the gills with folk sitting listening to the music on offer, on a small stage down at the bottom of the garden. We stood, at first, listening to the gentle rock and folk beat of Jimmy Le Fave and later the multi talented David Amram, who’d be backing all us poets later in the day. What’s coming through as I type this up, is how it’s the people I remember, their warmth, openness, curiosity about where we live, my poetry, whether it was at Mary Jo’s, the previous evening at Dorothy’s, the friendliness yet to be shared of the poets at the Via Dolce, Cornelia Street Café, Small’s Jazz Club… the Jack Kerouac Softball Game …. But I’m getting ahead of myself in reveries! So yes, Mary Jo’s, I found a wooden swing seat to sit on, and, sipping iced water, swung back and forth with three other people I shared the swing with, under the shade of a tree, listening to people joining in with songs and clapping, with tributes to Woody…. The buzz building up as the day grew hotter – ‘tho not as hot as it was last year!’ I bought a t-shirt with the Mary Jo slogan ion one side and a white buffalo on the other, Geoff bought himself a WoodyFest t-shirt and then he and I ate lunch in the Brick Street Café. I’m sitting here again, in my study, gazing out on wet snow covered fells and picking up the thread of the USA trip… we’re still in Okemah with quite a lot of ground to cover. What are my impressions, at this increased distance in time, of Okemah? Of Oklahoma? Let’s start with the slow lazy town, dusty road heat of Okemah. For me it epitomized my idea of a small town in America’s mid West. How? Wide streets, lazy air to the rhythm of walking, as if the heat drives people more slowly to churn engines, smiles, leg stride. The streets seemed fairly empty. Where was everyone? Like I say, we ate lunch in the Brick Street Café and that was humming! Packed to the rafters, there was life, chatter, buzz, energy, laughter. People hearing an English accent were like, hey where you guys from? What you doin’ here in Okemah? Oh, we’re here for the WoodyFest. Say, no kiddin’? You guys come all the way from ENGLAND just for the WoodyFest? Yep! - Dorothy, who as a child was a neighbour of the Guthrie’s, read a poem about her experience. It was a privilege to hear it. They were all welcoming to this woman who’d come from England – where? Cumbria! Where’s that? Oh well, north of Liverpool and Manchester, but south of Scotland. 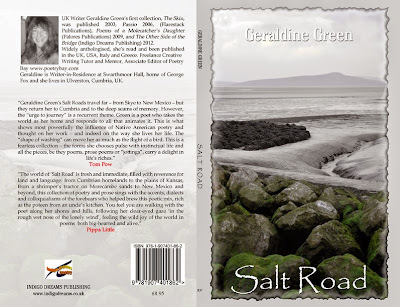 I noticed a general theme running through many of the poems, that of the land, either where people lived, or came from or had visited. And it made me think of poet friend George Wallace’s conversations with me about hefting. Herdwick sheep heft the land, they know it, know their own turf, where to feed how far to wander before reaching the limits of their boundaries and they pass this knowledge on to their lambs. This process of hefting was interrupted by the foot and mouth epidemic 2002-4. There are other ways of ‘walking’ [footnote, ‘ways of walking’ tim ingold] being hefted to one place and knowing that place intimately, in the writing of Aldo Leopold, John Clare and Norman Nicholson, for example, as well as indigenous people whose area of walking might be wide, as in the case of Aborignes and First Nation Americans, but who know that land in different seasons. There’s also a way of walking that explores new places, it’s a walking of exploration, of discovery. For me, as a Cumbrian pretty much hefted to Cumbria most of my life, my visit to America, Greece and Spain was a walking of exploration, of discovery. ... and in a small way, in that moment, I imagined what it would be like to live out in these plains where ice storms battered people in winter and tornadoes and hurricanes swept up houses and people, animals and cars in their paths smashing them before zipping up and over the Plains; imagines the First Nation Indians ‘this land is their land’ in their tepees, riding the storms; imagined the Pioneers heading west ‘young man, young woman’ in their wagon trains, to face death, starvation, fortune and hurricanes … and so we legged it to the cars, us civilised humans, soaking wet Carol drove us to her home in Oklahoma City. Next day, George was flying home to Long Island, but before that Carol, eager and happy to show us around, took us first to the site of the Oklahoma Bombing – note instinctive use of capital letters. [Why do we do that? Why feel the need to capitalise words? To create a memorial to remind us of death, or bravery or to mark the place where something extraordinary, out of the ordinary, whether celebratory or not, took place? I found the cowboy museum touching. There were graves outside to favourite horses, graves celebrating the strength of rodeo bulls – a poem by ‘an anonymous cowboy’ to his beloved horse, called Midnight. I found myself thinking of the history of not just Oklahoma, but the making of the United States and how, not so long ago, hundred years hundred fifty? 1890 (check!) the Land Run enabled people to rush in and stake a claim to a parcel of land, to build their homes on it to become part of the land - ‘this land is your land, this land is our land’- that became in the early 1900’s the state of Oklahoma. Our penultimate trip on the Oklahoma leg of the USA visit, Summer 2008, was to the Perkins Eagle Sanctuary, run by Native American Indian Victor Robidoux and his assistant. En route there, we stopped at the small neat town of Perkins, admiring its huge mural, painted on the side of a long brick wall; admired its smart hanging basket; its white, steel-girdered water tower, with PERKINS written boldly on it. After taking some photos we drove through Perkins, on the look-out for the Eagle Sanctuary. I spotted two eagles, not golden ones, but fish eagles, circling above a river. I’m saying look! eagles! A sign! But nope, we never stopped! We drove on a little way, and saw a small rather rundown home, with the standard front porch, which to my English eyes, looked so very mid-western American; beside the house were two, large mesh enclosures – just ideal, we thought, for injured eagles to be housed in. So we parked up and wandered around, looking for someone. Eventually, a man, dusting his hands down old, faded overalls walked towards us, with a young boy. We explained we were looking for the Perkins Eagle Sanctuary and a buffalo enclosure. I think due to a language/accent misunderstanding, they thought we had an injured golden eagle in the boot/trunk of Carol’s car! After one or two false turns off the main highway, we found the sanctuary and met the twinkle-eyed warmth of Victor and his assistant, Megan. I tell you, you could catch catfish with bubblegum – this in response to my asking him the two birds I saw, circling the Cimarron, were golden eagles – no, probably fish eagles. Victor and his assistant explained the ethos behind the sanctuary, how it had grown up and then showed us into the huge enclosed barn, with plenty of windows and light and branches – everything to make the injured or stray, eagles feel at home and able to recuperate before release – though some of them would never be released because their injuries were too great. And the feathers? Eagle feathers are not allowed to be used, you must have a special license to use eagle feathers for ceremonies. These are protected. We have a special license. If any birds die, we are allowed to use their feathers in our sacred ceremonies. We keep them for our tribe first; we give them to other tribes after. We honour the eagles; they are the Iowa Tribe Sacred Bird. And the feathers? We use the right wing for dance ceremonies; the left wing for religious ceremonies. And this eagle? What is his/her name, please? All this in soft undertones and asides and smiles and ‘you want to see buffalo? Sure! Lemme call up Ken, Knight, the cowboy. We thought, well, I know I did, that the cowboy he was calling would bring one buffalo up, a young one, perhaps, in the back of his truck, but no! next thing a roar and dust and hooves pounding and a big herd of buffalo came storming up the rise at the back of the sanctuary. I have never heard or seen anything like it. I asked Victor what they did with the feathers. ‘We give the other tribes any feathers the Iowa don’t need. When the tribes come, it’s a very emotional time. It’s the nearest they’ll get to an eagle and they come and pray. Give a tobacco offering to the eagle. ‘The Eagles have been good to us for years, now it’s our time to give back to them. before you net an eagle [in order to weigh it, measure it, or pinion their feather in order to examine them] you have to prepare yourself. Because you can’t show any fear. Keep talking to them. I talk to them all the time, in Iowa, in English. We flew to San Diego, via Salt Lake City, to stay with friends, Jerry and Diane Rothenberg. I’ll pause here, to give you the backstory to this visit. In September 2007, I read at the Kurt Schwitters’ Celebration in Ambleside and also at his last built Merz Barn, Chapel Stile, his artwork from the Barn is in a Newcastle-upon-Tyne Art Gallery. Anyhow, Professor Jerome Rothenberg – no wait! Another back story to this, is that I googled poetics and ethnicity, as part of my research into language, roots and indigenous people for my PhD and discovered ethnopoetics and linguistics, the authority and initiator for these fields of study was Professor Jerome Rothenberg. So, back to the Schwitters’ Festival. I read one night, then went to hear Jerry give a talk and reading the next. I got to chatting with he and Diane about my PhD, his poetry and research, their travels and asked them if they’d seen anything of Cumbria. ‘No’, they said. ‘We haven’t’ Well, it seemed silly to me that they’d come from San Diego to Cumbria and saw only the road between Ambleside and Chapel Stile! I offered to show them round some, on their free day, Monday, before their flight home. Showed them the Neolithic stone circle at Castlerigg. Jerry said to me, why go to America to study and talk with Indians, you have it all here! Cumbrian language and stories! This stuck in my mind on my visit to America. They invited me to stay with them, whenever I was next in America – which happened to be the following summer. and who is vice president? what is the role of the 100 senators? whose rights are guaranteed by the first 10 amendments? I recall that Jerry was excitedly anticipating the arrival of the proof of his new book, a study of Post Romantic Poetry, he co edited with Jeffrey Robinson, titled, Poems for the Millennium, Volume Three - The University of California Book of Romantic & Postromantic Poetry, which arrived the day before we left. He and Diane showed us around their area, up and down the southern Californian coast with its cliffs and the booming Pacific Ocean. They invited poet and lecturer friends from the University of California to dinner; we spent time chatting of poetry on ‘both sides of the Pond’ how it differs, how it’s similar. I told them of my PhD upgrade experience, prior to flying out to America and we discussed the importance of respect – whether of and for humans or golden eagles, the land or other cultures, languages, experience and spirituality. Thursday NYC – to be continued!